The EDER Powerwinch 400 is the fastest capstan winch we sell. With a pulling speed of 42 m/ min, this winch boasts the highest speed among the EDER Powerwinches. EDER Powerwinch 400 + 50m rope. Comes with 2 ton x 2.5 metre round sling and 2 ton bow shackle to secure winch. 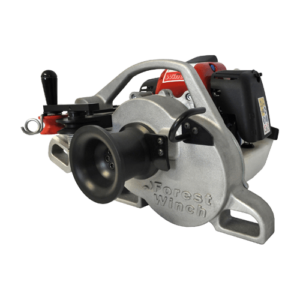 The EDER Powerwinch 400 portable capstan winch is the fastest portable capstan winch we sell. With a pulling speed of 42 m/ min, this winch boasts the highest speed among the EDER Powerwinches. It is driven by a powerful 2-stroke engine that can function efficiently at any given position. 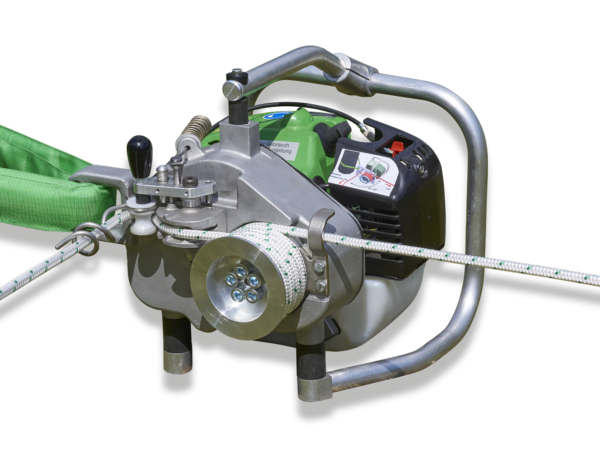 It can be operated using a light weight synthetic rope of any length, the rope can be transported or stored with ease using the transport bag. The high pulling speed of the EDER Powerwinch 400 portable capsatn winch makes it ideal for industrial applications such as cable pulling. The EDER Powerwinch 400 is powered by a 62cc 2 stroke engine. This means it can run in any position including at steep angles. It uses the same 2-stroke mix as your chainsaw so you only carry one can of fuel into the woods.